Jo Writes Stuff – Page 25 – I think that says it all, really. The last costume in my week of fancy dress was definitely my favourite. On the last day I lived out my childhood dream and dressed as a student of Hogwarts School of Witchcraft and Wizardry. I have been a die-hard fan of the Harry Potter series since I was a teenager, so much so that my sister’s friends frequently call me in to settle trivia-based arguments, so I put quite a lot of effort into this costume. A while ago I joined Pottermore and took the official Sorting test and was sorted into Hufflepuff. 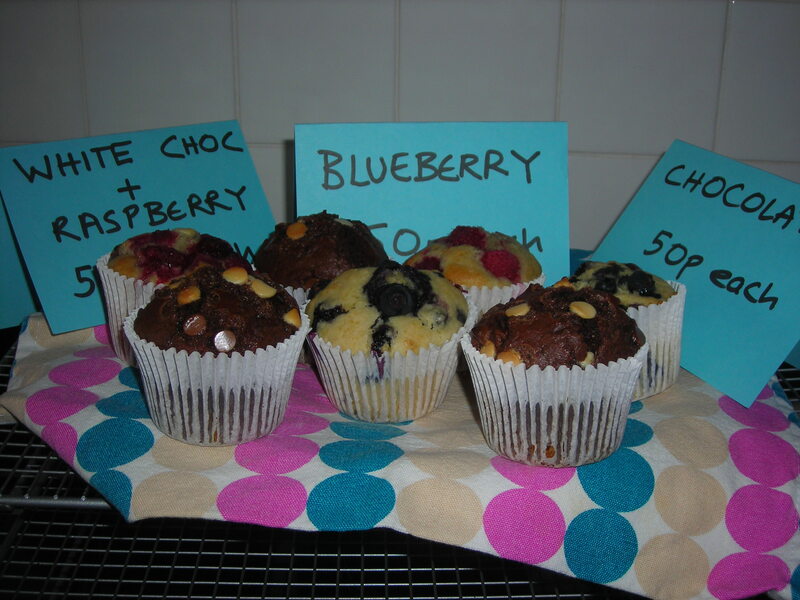 I eventually came to terms with the fact that I would never be a Ravenclaw and decided to raise money for charity in true Hufflepuff style. The bulk of the costume was pretty easy to put together. Because I knew there was no way I could afford a proper Hogwarts robe I worked from the movies’ version of the Hogwarts uniform. It’s very similar to most British school uniforms, and while I didn’t get an exact replica I certainly captured the uniform look. I wore a plain white shirt, a black skirt, black pumps and a grey jumper. The accessories was what really made this outfit, and they were surprisingly easy to find. I found a very close replica of the Hufflepuff tie for under a fiver on Amazon, and I happened to find a Hufflepuff badge lurking in my bedroom – I think it came from a Christmas cracker when I was ten. The scarf was a little more difficult. I actually went to the Harry Potter shop at Kings’ Cross station (and saw Platform 9 and ¾ OMG) but once I had gotten over my initial bout of squealing I was extremely disappointed to find that the shop did not stock Hufflepuff scarves. I skulked away – secure in the knowledge that no-one wanted to be a Hufflepuff – and eventually found one on Amazon for a pretty reasonable price. 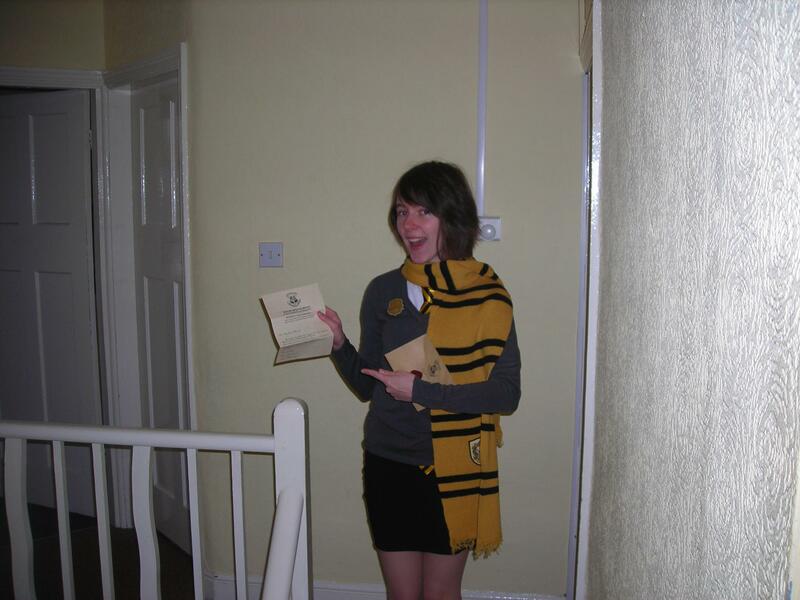 The best part was my Hogwarts acceptance letter, which my friends gave me for my birthday, and allowed me to pretend that I really was magical. I really enjoyed wearing this costume. It was perfect: it was comfortable, it was pretty clear who I was supposed to be, and it was sufficiently nerdy, so I felt like I was in on some secret inside joke all day long. The only problem I had – and it really was a minor one – was that it was extremely cold and my paper-thin tights didn’t really keep my legs warm. I solved that problem by buying an emergency pair of long, grey socks, which kept my legs warm and kept the overall look of the costume intact. I was very happy with this costume. I will be wearing it again – as part of my fundraising plan I said I’d wear the most popular costume in my final exam. I’m very pleased that this one won, as it’s by far the one I feel most comfortable in. I know it’s not an exact replica of the Hogwarts uniforms, but to be honest, I’m just proud that I made something so convincing in such a short amount of time. The fourth costume in my week of fancy dress was, I’m sorry to say, less than impressive. 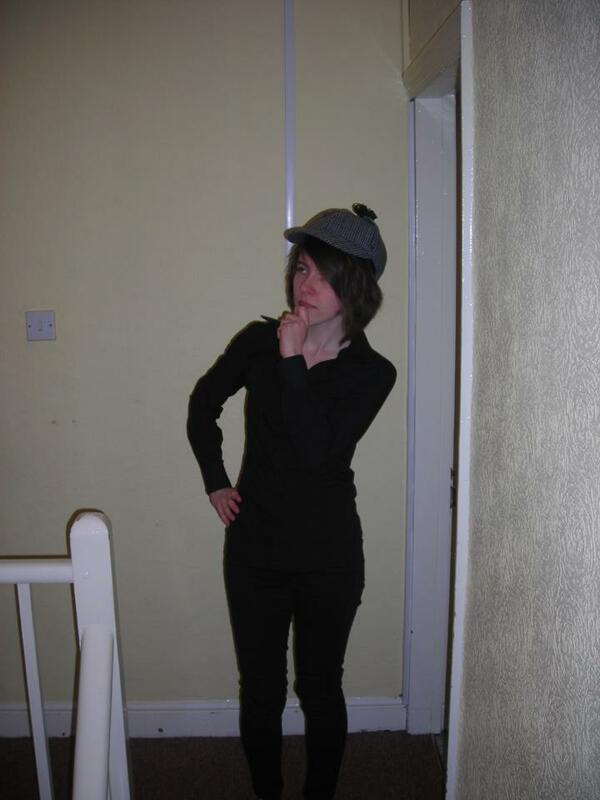 I was dressed as Sherlock Holmes, and overall I’m not really happy with this costume. When I first chose this costume I thought it would be relatively easy to put together. I’m more familiar with the recent BBC mini-series than with the original Conan Doyle books, so I chose to base my costume on the clothes Benedict Cumberbatch wore in the role of Sherlock. His style is quite formal, plain and dark – apart from the scene when he was wearing nothing but a blanket and I decided pretty early on that I wasn’t going to try and replicate that. This presented a challenge: while I had pretty much everything for the costume, because of its plainness it would be relatively difficult to convey who I was supposed to be. I did manage to get hold of a deerstalker hat – and from Baker Street, no less – and in the end I wore a black shirt, shoes and trousers to complete the ensemble. Needless to say, this didn’t really work. Adding a hat is not the best way to make a costume, and without Sherlock’s iconic coat – either Cumberbatch’s grey one or the original tweed greatcoat – it just looked like I was wondering around in a silly hat. Oddly enough, when I had buttons taped to my glasses or was wearing a bright pink wig, I felt less embarrassed than I did in that costume. It was nice to be able to take off the hat and pass as a normal person for a few seconds, but ultimately, I would have preferred to have done this one properly. Unfortunately, time and money made this impossible. I wasn’t really happy with this costume. I think if I was going to do it again I’d put a lot more effort in, and maybe splash out on a coat which would add to the costume (or perhaps a pipe, if my budget is going to remain this tight for the next few years). Strangely enough, going overboard on a costume actually makes it easier to wear in public; as I hadn’t really gone all-out with this one it was by far one of the most embarrassing days of the week. If I was to do the whole week again I’m not even sure if I’d include this costume, but that’s looking pretty unlikely. My third fancy dress costume is one of my favourites, but also one of the ones I was most nervous about. 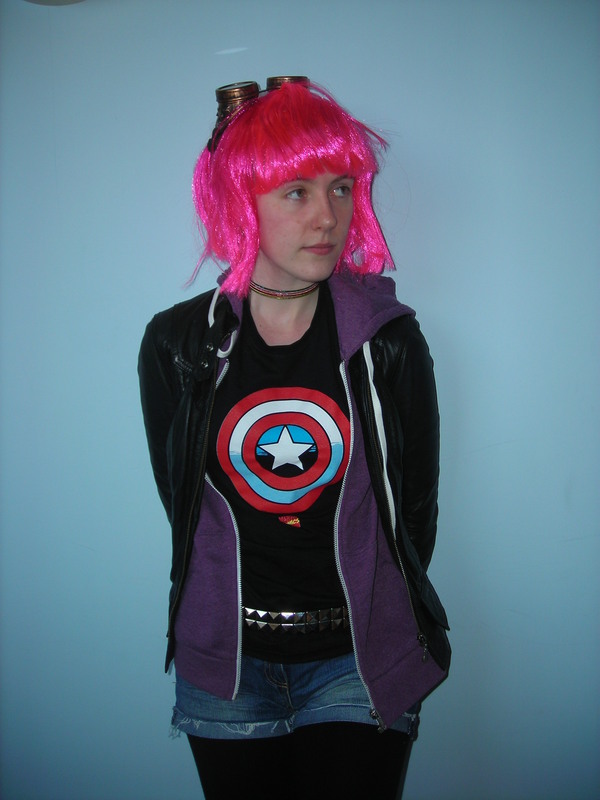 I dressed as Ramona Flowers from the Scott Pilgrim series and sweet Jesus, it was difficult. Ramona Flowers is a character who a lot of people have already cosplayed as, so the bar was set pretty high. My student budget meant that getting an exact replica of one of her outfits was way beyond my reach, so I had to put together something ‘Ramona-esque’ while spending as little money as possible. I decided to imitate one of her looks from the 2010 film, but based my choice on how much new stuff I had to buy rather than choosing one of my favourites. The outfit wasn’t that difficult to put together. After re-watching the film a few times – all in the name of ‘research’ – I had a pretty good idea of the way she dresses. Ramona’s outfits all focus around layers, usually aren’t very girly, and have a lot of bright colours teemed with darker, edgier stuff like leather jackets and studded belts. This was pretty much perfect for me, and in the end I wore my Captain America T-shirt, a purple hoodie, a black leather jacket, denim shorts, black tights, a studded belt and some gothy boots that you can’t see in the photo. I had to buy the belt, hoodie and the shoes but everything else I already had. Unfortunately, I did have to do some more arts and crafts for this outfit. I bought a pair of steampunk goggles as part of the outfit. They looked perfect, but when I tried them on they made my hair bulge out in odd ways, and seeing how important Ramona’s hair is in conveying the character, I really didn’t want that. So I improvised, bought a cheap hairband from the local supermarket and literally taped it to the goggles. I had to pin it all in place to make it stay on when I moved my head, but all in all I’d class that as a success. That just left the hair. Ramona is famous for her brightly coloured hair, and recreating it was going to be a challenge. I didn’t want to go the whole hog and dye my hair permanently, as bleaching my hair and then dyeing it would be incredibly expensive and I didn’t want to make that permanent a change, even if it was for charity. I’ve experimented in the past with spray in hair dye and the results had been pretty good, so I bought a couple of cans from a fancy dress shop and just sprayed them in on the first day of my fancy dress week, when I’d originally been planning to wear this costume. TEST THE HAIR DYE BEFORE YOU COVER YOUR HEAD IN IT. The dye looked awful. Thankfully there’re no pictures of that fiasco, but I can assure you all that the ‘forest green’ hair dye I’d bought was both the colour of pond sludge and the colour of radioactive waste at the same time. To top it all off, the dye made my hair look really slick and greasy, and the end result just looked like the Incredible Hulk had sneezed on my head. I washed it all out and wore another costume that day, and then ordered an emergency wig from Amazon, which I had to alter before I could wear it. I only just got it done in time, so I’d definitely recommend a little more planning if you’re thinking of wearing a Ramona costume yourself. Once the costume was all put together I was very happy with it. It was pretty clear who I was supposed to be, and while it wasn’t quite what I had in mind at first, it was definitely the best I could put together with my budget and time constraints. The one major problem I had apart from the hair was my headgear. I had to wear a skullcap to keep my real hair out of sight, and after wearing both the wig and my steampunk hairband on top of it for a day, I had a colossal headache. I think this holds up as a beginner’s cosplay, but perhaps not in more experienced circles. I’m certainly proud of the way I put this costume together despite my limitations, but if I was going to wear it again I’d spend more time on the hair so I could really get it right. Apart from the wig, everything I bought can be worn again, so overall I’m pretty happy with this. 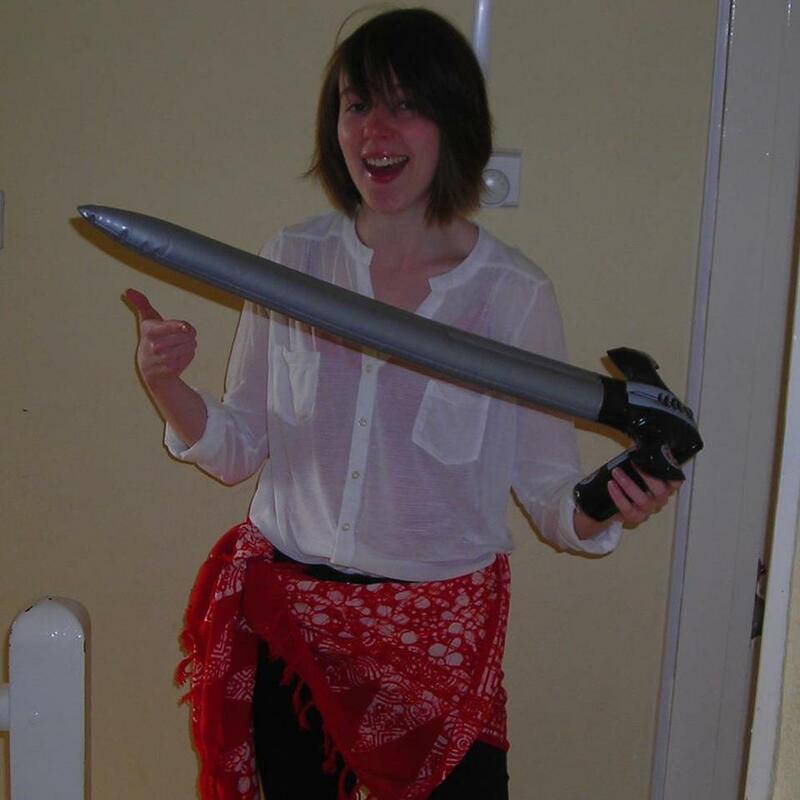 My second costume for my fancy dress week was the one that got the most attention. 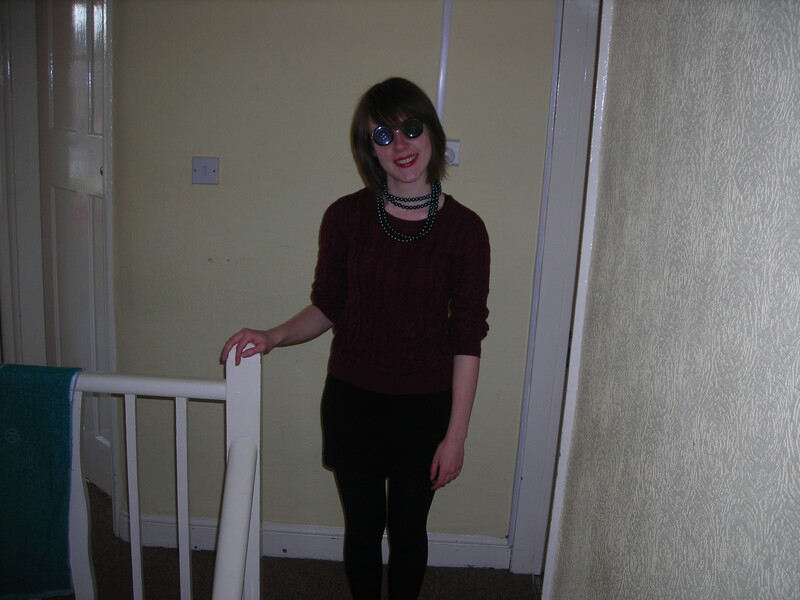 I spent a day dressed as the Other Mother from Neil Gaiman’s ‘Coraline’, and it’s definitely one of the better costumes I made. Mr Gaiman retweeted the picture, and after I finished flapping my hands in a state of nervous excitement, I got the idea for this blog. The costume was surprisingly easy to put together. Because I was recreating a whole character rather than a specific outfit that left a lot more room for interpretation. As well as the book, I had the 2009 film as inspiration, and the finished look was a combination of the two. As ever, keeping it cheap was my main concern and I put together the outfit from clothes I already had. The only real challenge was the button eyes. I’ve always thought of the Other Mother as one of the creepiest villains from children’s literature second only to the Grand High Witch from Roald Dahl’s ‘The Witches’. She’s terrifying. Part of the fear that these characters inspire comes from their relatively normal appearance that conceals something monstrous. The Other Mother is almost an exact replica of Coraline’s real mother, save for her black button eyes. With that in mind, I wanted to keep my outfit looking relatively normal, feminine and conservative, while still retaining an air of menace. In the end, I chose a black dress and tights, a dark red jumper and some black pearls that I found in a charity shop for about £2.50. I also stuck on some evil lipstick (dark red is for villainesses) but I didn’t want to go for anything too showy that would distract from the button eyes. Now I’m rubbish at arts and crafts and always have been, so this was the part of the costume I was worrying about the most. I wanted to have something convincing, but something that I would also be able to make without slicing open a finger or gluing my hands together. In the end, the method I found was surprisingly easy, and cost just under £10. Take a pair of fake glasses. The lenses must be round and if possible, the frame should be as unnoticeable as possible. I went for glasses framed with a thin, gold wire and they were perfect. Take a pair of buttons. At the very least they should be the same size as the lenses, but ideally you’d want them fractionally bigger, to hide as much of the frames as possible. As for the colour, you can pick any you like, although black is traditional. Take some blu-tack, glue, or double-sided tape. I used blu-tack because I’m lazy. 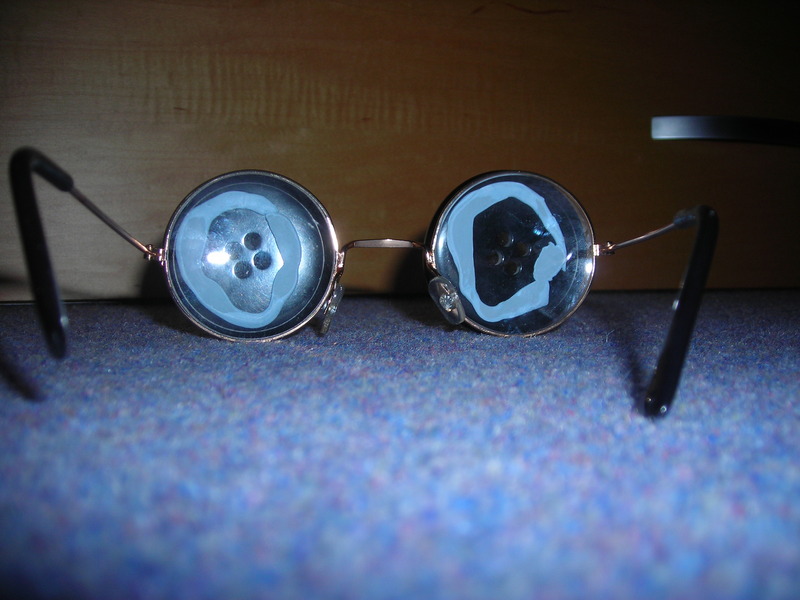 Stick the buttons onto the lenses, being careful to keep them roughly in the centre. Have a cup of tea and congratulate yourself. That was hard work. I was very happy with this costume. It was immediately obvious who I was supposed to be and I successfully creeped out people who hadn’t even read the book. It was very effective; all I had to do was tilt my head and smile and they’d just back away. However, I can’t recommend wearing the button glasses for long periods of time. You can see through them but it’s quite an unsettling experience as you have to rely on what’s directly in front of you and your peripheral vision. I had to keep taking them off, as after about an hour I was beginning to get a headache. Aside from that, the only other downside was that I had to keep reapplying my evil lipstick all day. I’m very proud of this costume. I’d definitely wear it again, although perhaps not for a whole day. All the pieces that make up the costume can be worn as normal clothes and I think it holds up as a decent cosplay. Also, it was cheap and easy to put together, a fact for which I am eternally grateful.